It was hard for anyone to walk away from Tuesday's Golden State Warriors win over the Denver Nuggets without fawning. Denver scored 117 points on a home floor on which they had previously run up a 39-3 record during 2012-13, and still lost to a Warriors team that seemed to get whatever it wanted following a smart screen and long jumper. Stephen Curry and Klay Thompson didn’t even take a free throw in the win, and yet they combined for 51 points on just 34 shots because the pair’s outside marksmanship was so brilliant. "In my opinion, they're the greatest shooting backcourt in the history of the game," Jackson said, sounding not the least bit hyperbolic on this night. Contrary to the work of most of the comment providers you’ll see at the bottom of our posts (contributors who seem to offer the “nobody can shoot in the NBA anymore” statement alongside “nobody plays defense in the NBA anymore” in equal doses), shooting in the NBA is as good as it has ever been. The 3-point shot is a significant weapon in the modern NBA, so much so that if you field a shooting guard or small forward in your starting lineup that shoots below the league average of 37 percent from long range, you’re considered somewhat of a detriment if you don’t make up for that percentage in several other areas. The game has changed. And because it’s far more preferable to hit 40 percent of your 3-point looks than 45 percent of your 2-point jumpers and interior shots, smart coaches are moving away from the rim in increasing numbers. And Warriors coach Jackson, though he was prone to some showy stuff in his rookie season with Golden State, is a very smart coach. He’s put together a brilliant screening system that allows Curry and Thompson extra space to launch away. And, in 2012-13, the pair took full advantage. The two combined for a remarkable and historic 483 made 3-pointers, shooting nearly 43 percent along the way. These are ridiculous numbers made all the more impressive with two further facts — Curry is just 25, while Thompson is 23; and backup hybrid guard Jarrett Jack came off the bench during the regular season and made over 40 percent of his own 3-pointers. Still … the greatest ever? Why not? Jackson didn’t call the two the greatest scoring backcourt in NBA history (although at a combined 39.5 points per game with ridiculous efficiency, the two aren’t half-bad), he just pointed to the strength of their respective strokes. Not only did Curry break the record for most 3-pointers in a season this year, but he did so on a nearly league-leading 45 percent mark. That mix of usage and efficiency boggles the mind, as does the fact that Curry and Thompson combined to top the NBA’s record for teammates (much less a backcourt) with the most 3s in a season — topping the mark set by the Orlando Magic’s Nick Anderson and Dennis Scott in 1995-96 with a week still left in the NBA’s season. Nick and 3D, you’ll recall, had the luxury of a shorter 22-foot line and endless Shaquille O’Neal kickouts to do their damage. 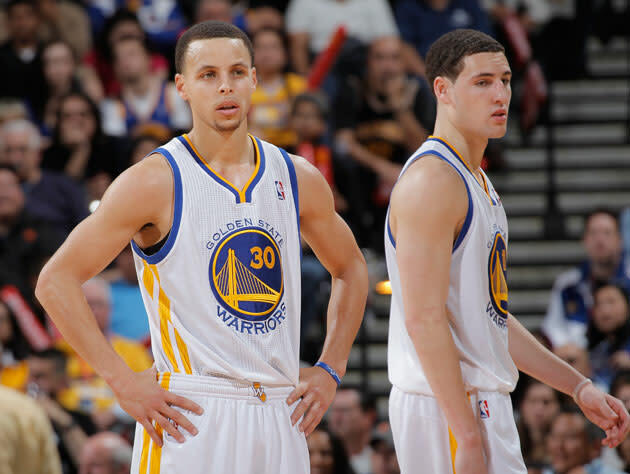 So who are Curry and Thompson’s best comps? 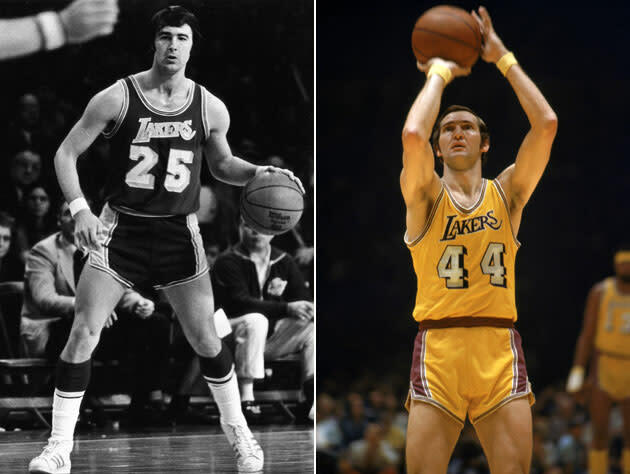 Some have pointed out the Los Angeles Lakers’ legendary duo of guards Jerry West and Gail Goodrich. Neither had a 3-point line against which to test their accuracy some 40 years ago, but both were effortless scorers as adept with the drive and pivot as they were with pulling up from above the free-throw circle. Judging by NBA TV replays alone, it’s probable that both would have worked far above the 40 percent clip from long range, with the devastating passing touch of Wilt Chamberlain helping along the way. Then there’s the 2004-05 Phoenix Suns, a team that basically dragged the NBA into its modern era by embracing movement that went away from the typical two-to-a-side half-court sets aggressive NBA coaches foisted upon us for years prior. 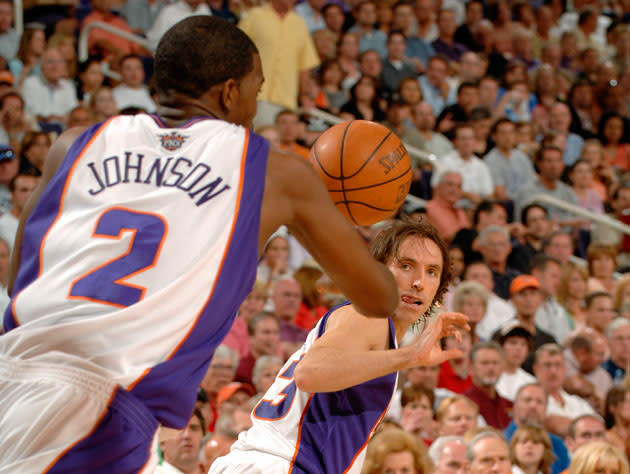 Those Suns took advantage of increased enforcement of hand-check laws and the marvelousness of the corner 3-pointer to rack up nearly 800 threes that year, with Steve Nash, Quentin Richardson, Joe Johnson, and Jim Jackson all either making heaps of long-range shots or shooting an excellent percentage. Nash “only” made 94 treys that year, though. Jackson had just 68, and Quentin Richardson shot only 35.8 percent from outside while taking an ungodly 631 dingers. And Johnson, in the corner, was more of a small forward as opposed to a backcourt helper. Maybe Mark Jackson isn’t off. Maybe it’s too early hand the title to Mssrs. Curry and Thompson — both still have much left to prove in terms of consistency, health, and long-range goals — but for a second full season together, this isn’t a bad start. And you can be sure that both Curry and Thompson, sons of much-respected ex-NBA players in Dell Curry and Mychal Thompson, are going to keep their respective heads on straight moving forward. Maybe we are seeing something special. All the more reason to tune into this series, friends.